Enjoy the crispylicious, juicylicious Chickenjoy with 3 pieces of Shanghai rolls, a half-portion of Jolly Spaghetti, rice, mini sundae, and a regular drink in the new Chickenjoy Super Meal for only P135. The forever loved 1-piece Burger Steak with rice also comes with a half-portion of everyone’s favorite Jolly Spaghetti, 3 pieces Shanghai rolls, a mini sundae, and a regular drink in the Burger Steak Super Meal for only P125. Meanwhile, your favorite Jollibee snacks are all featured in the new Yum Super Meal! It comes with the langhap-sarap Yum Burger, a half-portion of Jolly Spaghetti, mini sundae, regular fries and regular drink for only P115. The Jolly Super Meals are definitely the sulit-sarap choice this holiday season, available in all Jollibee stores nationwide. 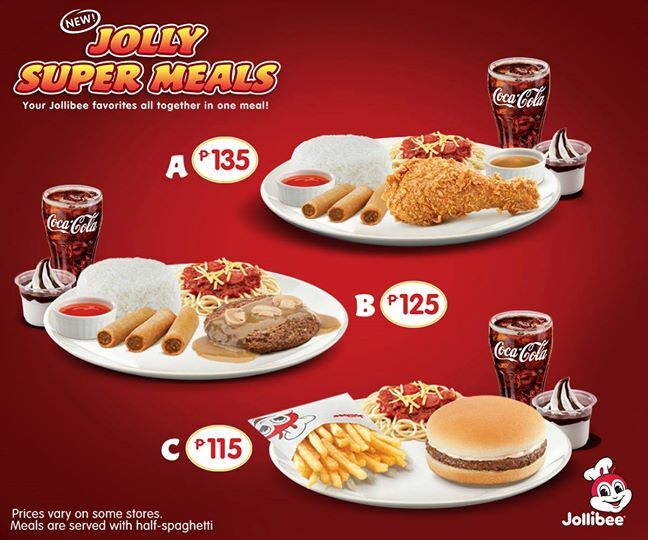 So, hurry to a Jollibee store near you and fill up on these delicious and perfectly-matched combo meals.